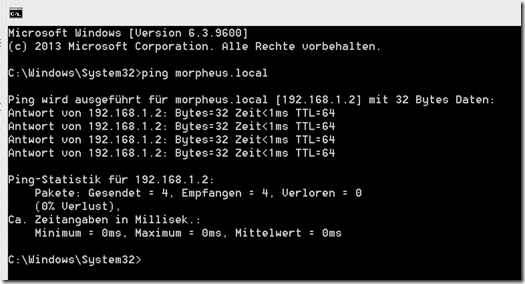 In some situations you would like to access the same computer / IP using different .local names. This is possible using the Avahi daemon. The following is written for Ubuntu 18.04 Bionic Beaver. Avahi automatically adds your computer’s hostname to the .local Domain. For instance, my computer is called morpheus. By the way, if you want to access Zeroconf / Bonjour / Avahi .local domain names, you should simply install Apple’s Bonjour Print Services for Windows. The –R flag is important: it will allow you to publish several domain names for the same IP, as it will NOT publish a reverse entry with the address. (Otherwise, obviously the reverse entries would collide, and therefore avahi refuses to publish them). The –a flag registers an address/host name mapping. This command will run in the foreground. While it is running, the domain will be published, and you can access your computer using this additional domain name. Ideally we want this to happen on startup. Adjust the script with the names you want to have. Add the command using crontab. Here you can see that I can ping several different “aliases” .local domain names for the same IP. If you want to publish .local domains for other computers / devices, which are not capable of publishing them for themselves, you can also do this with Avahi. Add a line for each device, e.g.